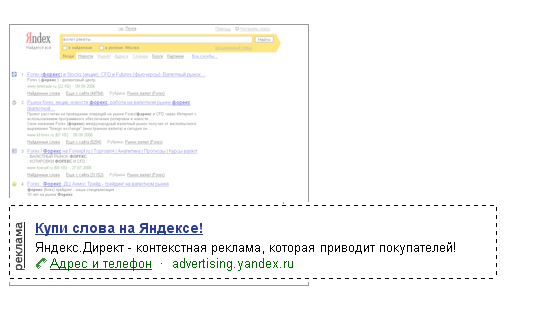 Premium placement means an advertising block with high CTR located above the search results (under the search string or thematic insets of Yandex services («wizard»: http://help.yandex.com/search/?id=1059399)) or main contents of a Yandex.Catalog page. 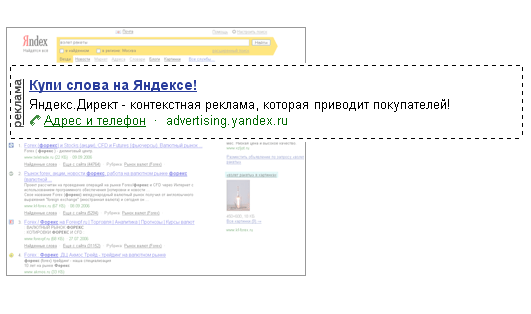 On the Advertising spaces specified in 2.2 of these Rules ads may be displayed containing the Advertisers images (hereinafter referred to as the «Image») that should comply with the requirements available at https://yandex.com/legal/direct_adv_rules_ch/. According to the settings chosen by a YAN partner Impressions may be performed with displaying of the Images or without any Images. Yandex does not guarantee that the Impression will be performed with displaying of the Image. The Impression on the Advertising spaces specified in 2.2 of these Rules shall be deemed duly performed (in compliance with the Advertiser ads and specified by the Advertiser terms and conditions ads placing) irrespective of whether it contains the Image displayed thereon on not. The Cost per Click on the link containing in the Image shall be determined under article 4 of these Rules. 5.6. In order to improve the quality of Yandex.Direct system and its services, and to develop new offers for the Advertisers, Yandex may periodically carry out experiments (the duration of each certain experiment not more than 2 weeks). In the course of such experiments, Ads displayed on personal computers and mobile devices of certain Users randomly selected by the system (with the number of such Users not exceeding 10% of the whole audience) may be displayed on the Advertising spaces subject to modified conditions of the Impressions of Ads including but not limited as to selection and arrangement of Ads as compared to those specified for the Advertising spaces in these Rules. 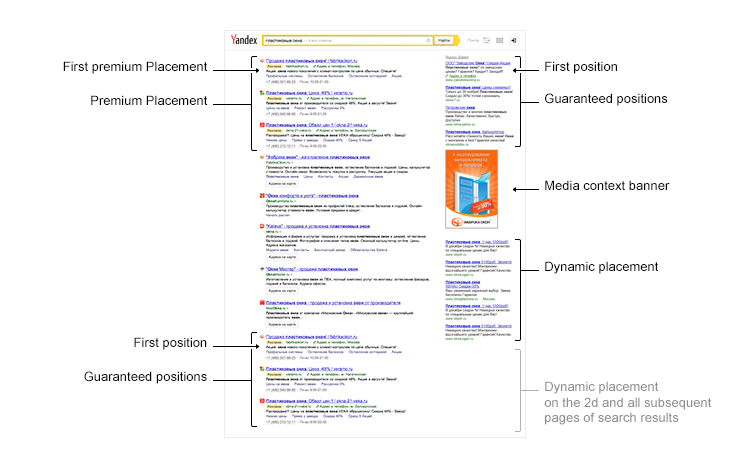 While carrying out an experiment, Yandex does not guarantee that each and every Ad will be displayed in compliance with the order of placing Ads on the Advertising spaces, and selection conditions specified in clauses 3 to 5 of these Rules and in compliance with the other provisions specified in these Rules, also the Impression of the Ads may be accompanied by additional information material of the Yandex Services (such as marks of the goods/shops, comments concerning the goods/materials, but not limited). However, the experiments will not affect the Cost per Click fixed by the Advertiser in accordance with clause 4 of these Rules and will not change it in any way. Payment for the Services shall be carried out based on the Cost per Click determined in accordance with clause 4 of these Rules. Any information about such experiments shall be made available to the Advertiser upon its request sent to the customer support service using the feedback form at http://feedback2.yandex.com/direct/ specifying the reason for its submission and the number of relevant advertising campaign. Following the request, the Advertiser will be provided with information about the upcoming experiments that will start within 7 (seven) calendar days after the date of the Advertiser's request, as well as information about the ongoing experiments carried out at the time the request was received. *For the purposes of these Rules Yandex partners resources include the service go.mail.ru.